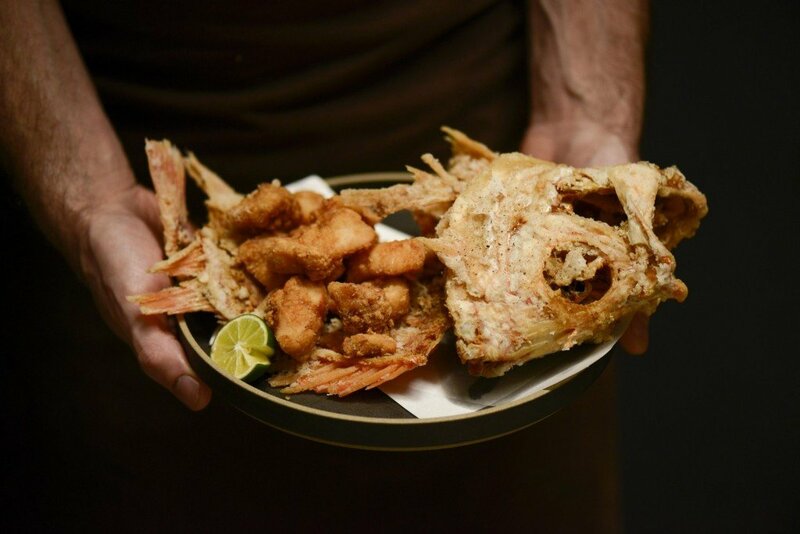 Following on from the extraordinary success of his first Hong Kong restaurant venture- the widely acclaimed Japanese izakaya- style eatery Yardbird – chef-owner Matt Abergel (with partner Lindsay Jang) has recently opened a sleek new Japanese inspired dining bar under the designation RONIN. Applying his impeccable Japanese cooking techniques to a new dining concept, Abergel changes focus at RONIN, evolving from the innovative yakatori fare of Yardbird, to a modern seafood based cuisine, served in an intimate environment of laid-back sophistication. Typical of the premier contemporary dining bars of Japan, RONIN places equal emphasis on both drinks and gastronomy- with the bar offering probably the largest selection of Japanese whisky in Hong Kong, plus a full range of exclusively Japanese beverages ranging from sake, shochu and umeshu, to Japanese craft beers, and cocktails- all matching perfectly with the exquisite seafood cuisine. Discretely nestled in an almost hideaway location on a steeply inclined laneway in the same fashionable Sheung Wan neighborhood as its sibling Yardbird, the long, narrow interior of RONIN is entered from an unmarked sliding doorway in the dark grey facade of a nondescript building. The sleek, contemporary interior features a restrained decor of dark grey wall and ceiling surfaces, with contrasting warm-toned timber bar counters and unpolished flooring. 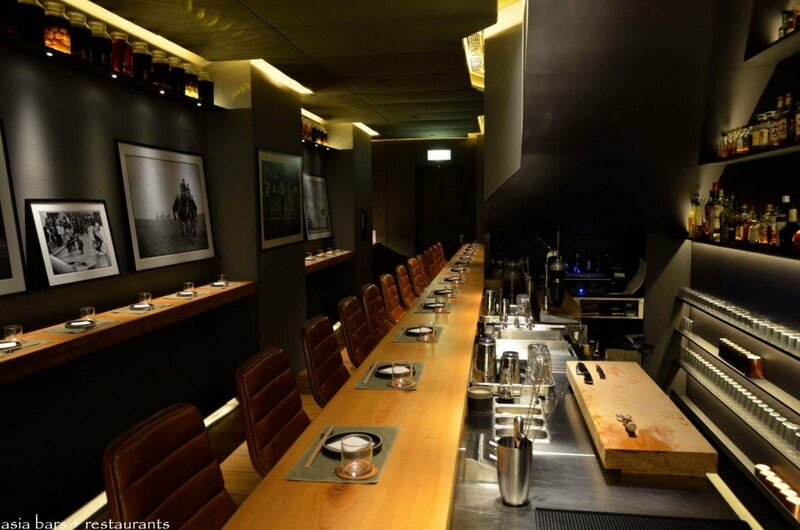 With seating limited to only 14 place settings at the main bar counter, a further 10 customers can be accommodated at the standing-only counters that extend across the opposite wall. 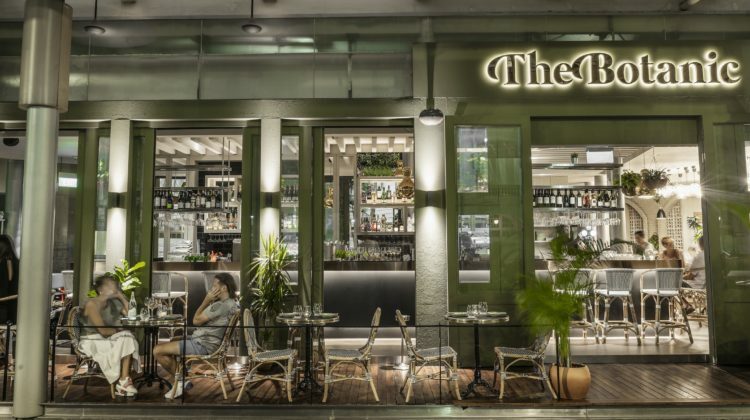 Dim lighting and the minimalist interior suffuse the space with a laid-back sophistication conducive to the appreciation of fine drinks and superbly prepared fresh seafood dishes. 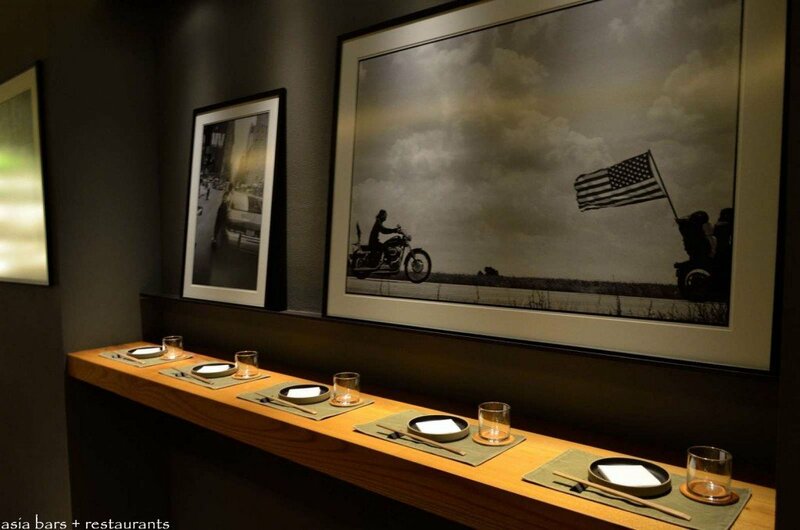 Similar to Yardbird, service is upbeat and approachable, with the staff casually attired in jeans and tee shirts. Unlike Yardbird, reservations are accepted- and encouraged. RONIN features a daily menu- date stamped and printed onto a single sheet- of classic and modern Japanese seafood dishes- with elements of culinary cross-pollination evident in some of the ingredient combinations. Sourcing both the finest local seafood, and premium imports from Japan, while many of the dishes remain a constant on the menu, daily revisions reflect seasonal and market availabilities. 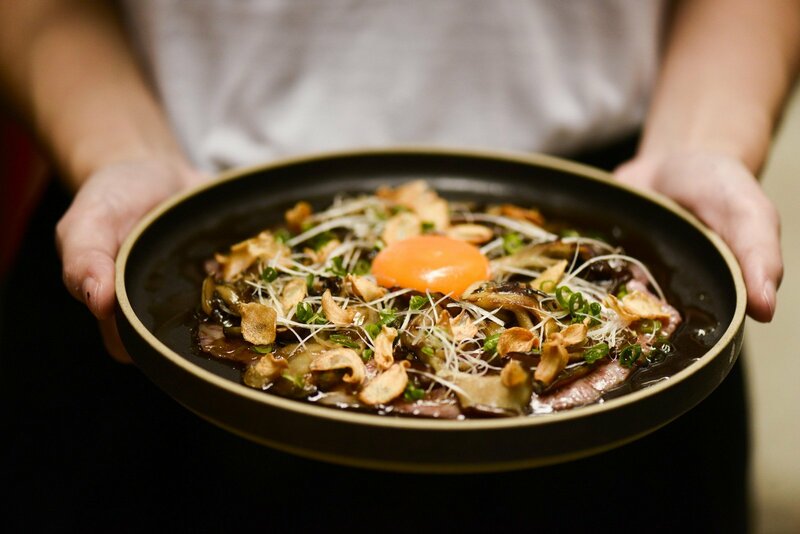 The concise menu is assembled under three categories- “RAW”; “SMALLER”; and “BIGGER”– consistent with the traditional progression of dishes in Japanese izakaya-style dining. Dishes under the “RAW” category typically include at least four variations of sashimi, plus fresh Japanese oysters. “SMALLER” dishes on a recent menu featured items such as tempura dishes- Whitebait, Mentaiko, Shiso Tempura; and Smoked Silver Beltfish Tempura; and other alluring dishes such as Razor Clam with Spring Onion, Ginger and Crispy Rice; and Etajima Oysters served with Smoked Cauliflower and Celery. 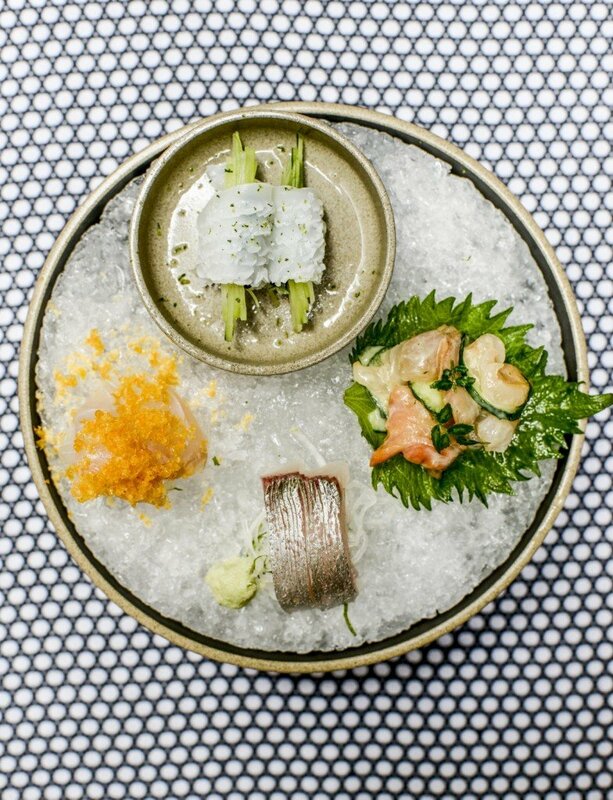 And finally, under “BIGGER”– more substantial offerings such as Deep Sea Snapper with Kimchi and Amaranth; and Unagi, Kinome, Chirashi and Rice. Irrepressible carnivores are also accommodated with a couple of non-seafood options such as Quail or Kagoshima Beef. 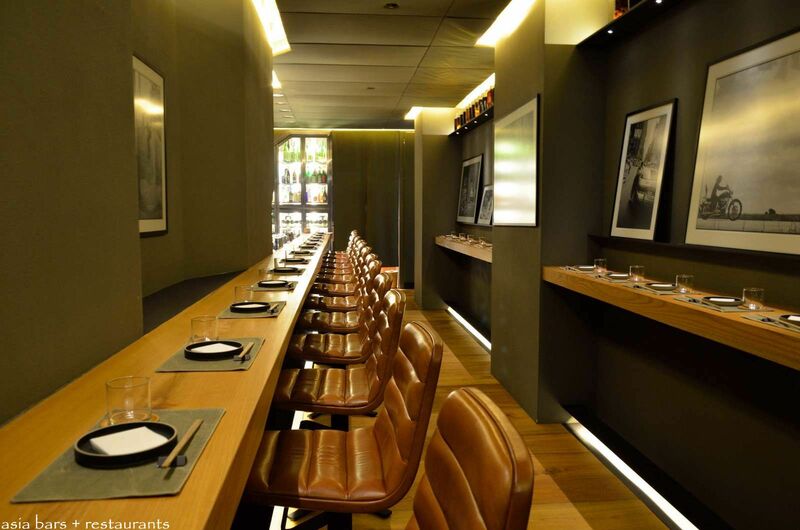 A Market Tasting Menu is also offered at HK$800 . 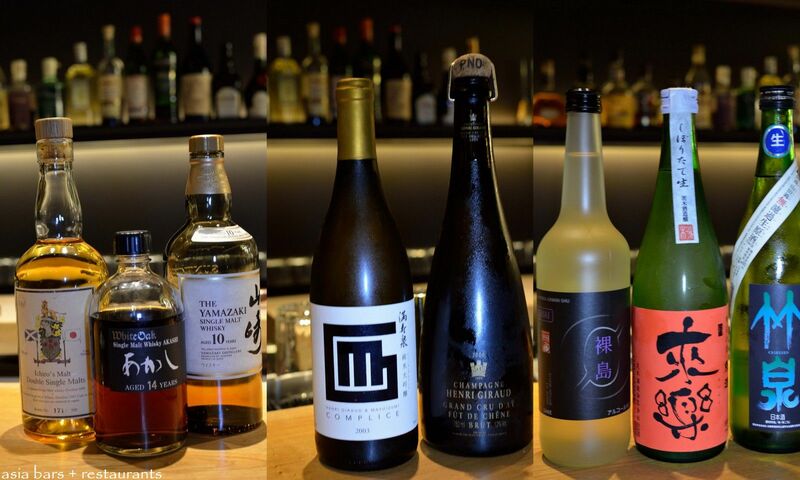 The beverage program at RONIN is highlighted by their impressive selection of 80+ Japanese whiskys- individually sourced from both major distillers and regional artisan producers. 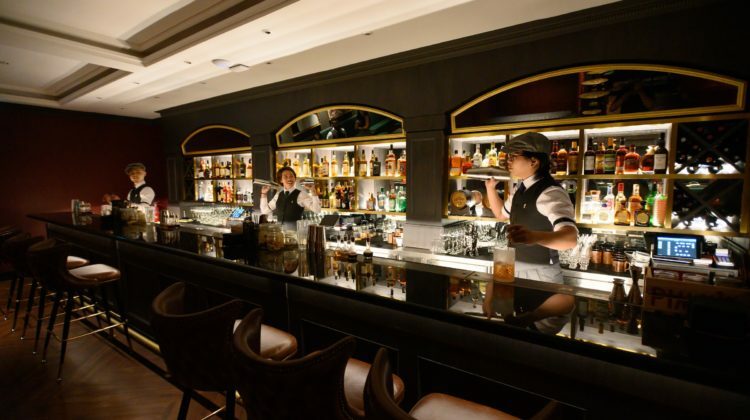 Stand-out selections include rare aged bottlings that are exclusive in Hong Kong to RONIN. Complimenting the whisky offerings is a well-crafted list of premium sake, including their exclusive Yardbird private label bottling. 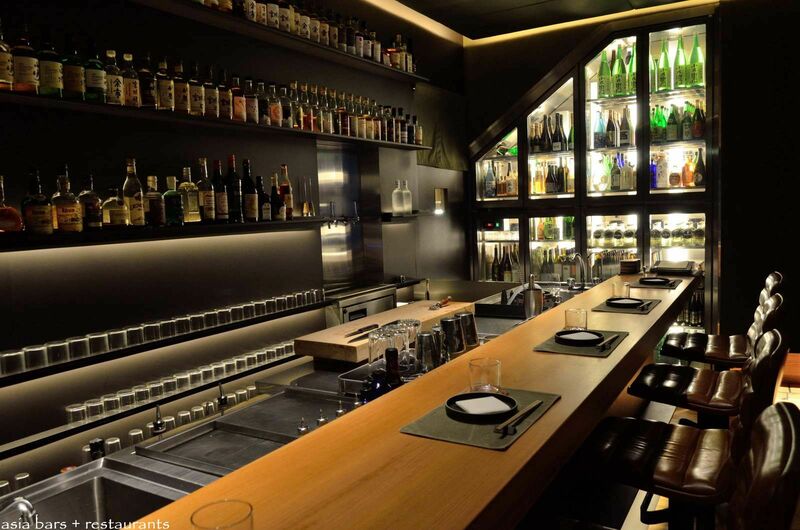 Other Japanese beverages include selections of shochu and umeshu, and on tap- Hitachino Nest White Ale Draught, and Suntory PilsnerDraught, plus several bottled craft beers. A compact range of cocktails- classic and Japanese-inspired- include the Cocoa Nib Old Fashioned– Yardbird Cocoa Nib Shochu, Pampero Añejo, Chocolate Bitters, Gomme; Red Hook– Suntory ‘Shirofuda’ White Label, Mancino Vermouth Rosso, Luxardo Maraschino, Lemon Bitters, Mint Leaves; and Rusty Ale- Suntory ‘Kakubin’ Black Label, Drambuie, Wilkinson Ginger Ale, Lemon Bitters, Lemon. RONIN opens for dinner Monday to Saturday from 6:00 pm until midnight. Seats at the bar can be booked for early, mid and late evening sessions. 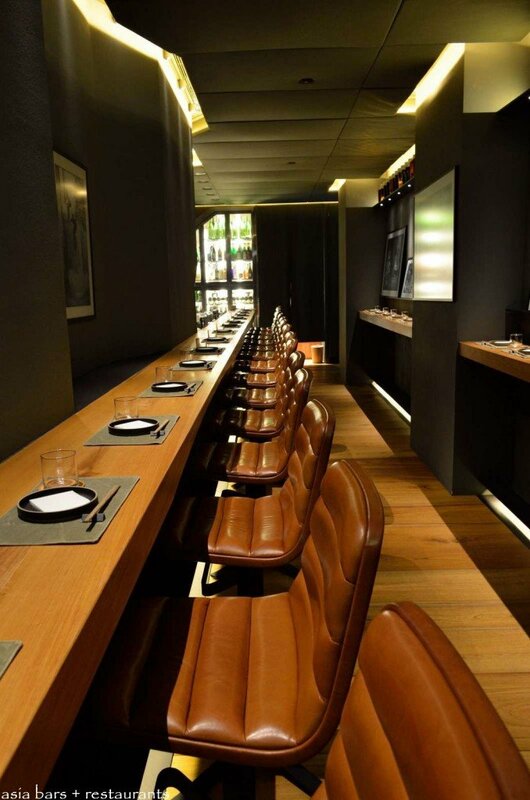 Attractively modern design featuring a minimalist decor, exudes a Japanese aesthetic of under-stated sophistication. One section of the standing-only counter that spans the back wall- monochrome photographic artworks offer visual highlights to the minimalist interior. 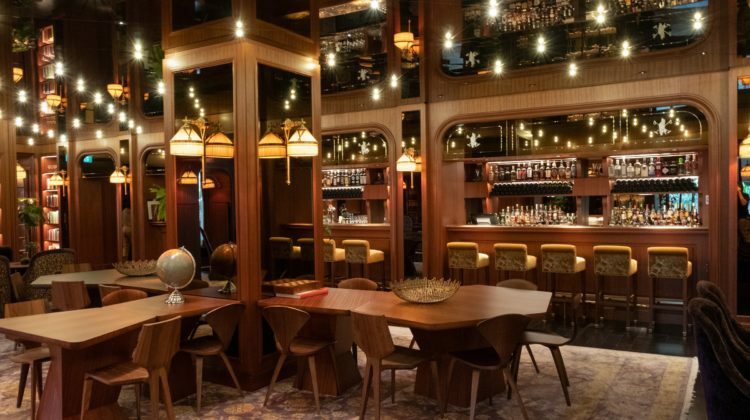 The most prized seats are those facing into the bar, with the partially open kitchen located in a compact space adjacent to the bar. Looking down the impressive dining counter- spanning the entire length of the room from the entrance to the kitchen at the far end of the compact interior. 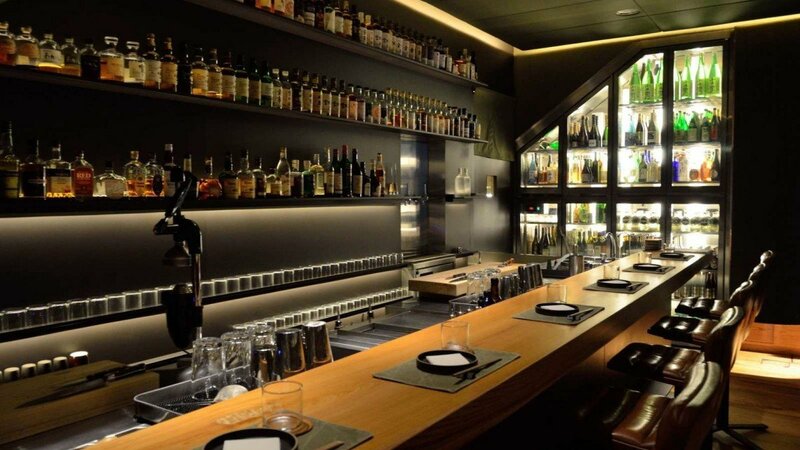 Both the bar counters and floor boards are crafted from timbers of the Japanese “Keyaki” tree- providing a contrasting natural warmth to the dark grey tones of the walls and ceiling. 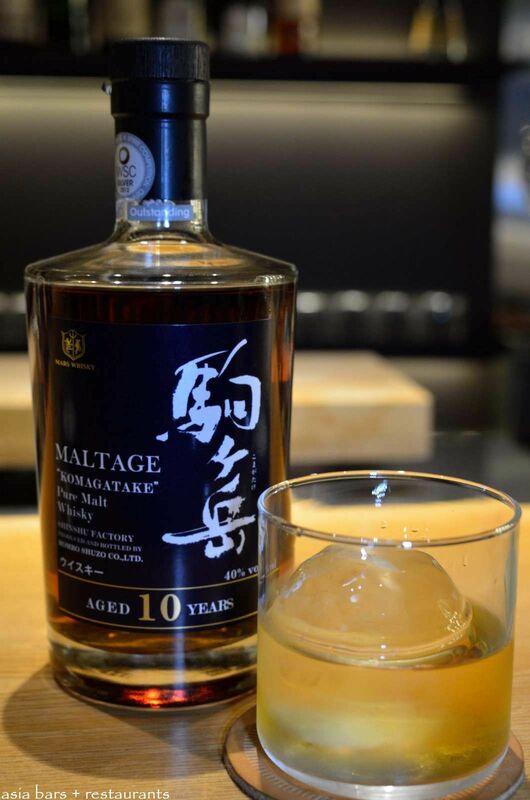 Whisky is served in classic tumblers with hand-carved spheres of ice. The beverage list at RONIN features an exceptional selection of 80+ exclusively Japanese whiskys- many sourced directly from artisan distilleries- and available exclusively at RONIN. 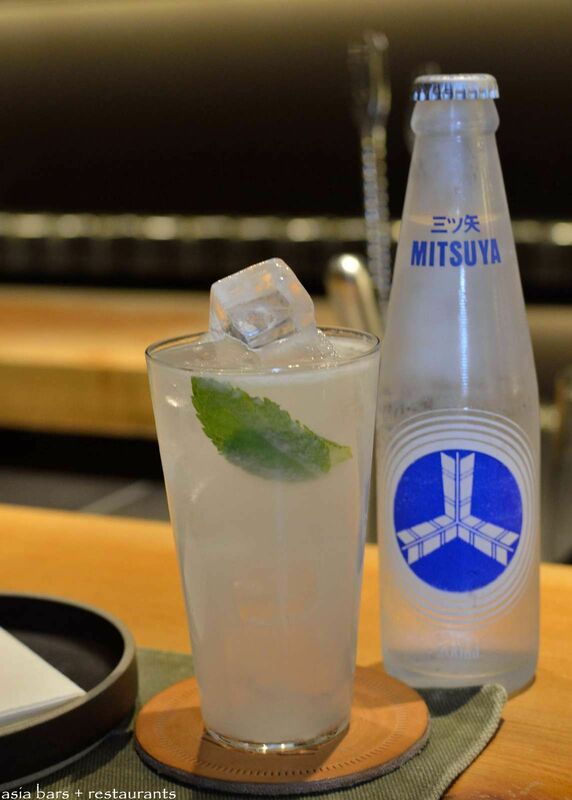 Mitsuya Sider- Denizen Rum, Orgeat, Mitsuya Cider, Mint Leaves, Lime. A nice detail are the monogrammed bar coasters hand-crafted from leather. 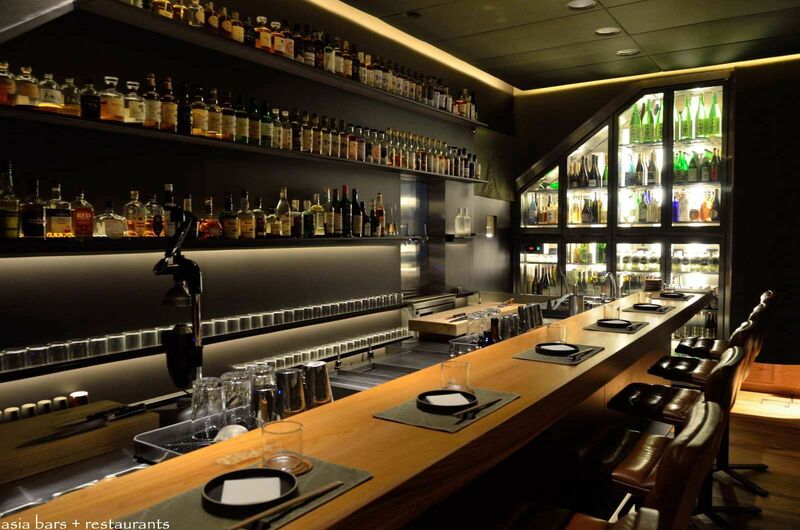 Selections from the extensive range of Japanese whisky, sake and shochu. 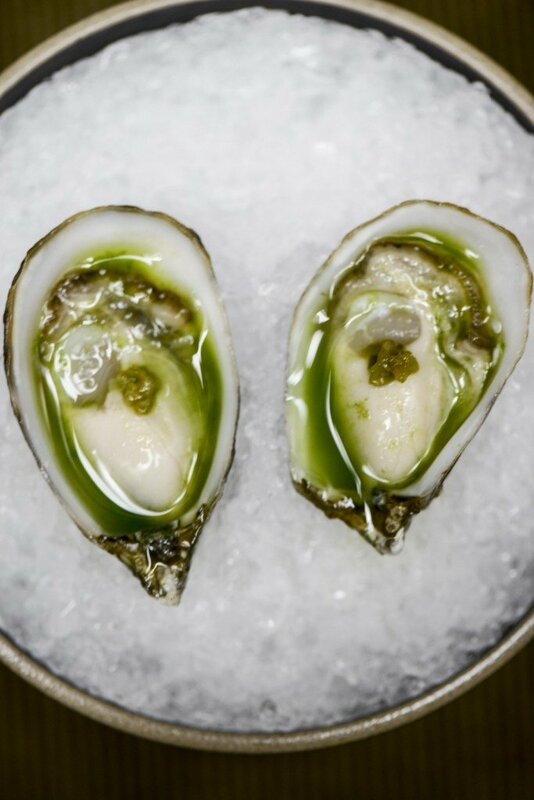 Shigoku oysters, cucumber water, yuzu kosho. 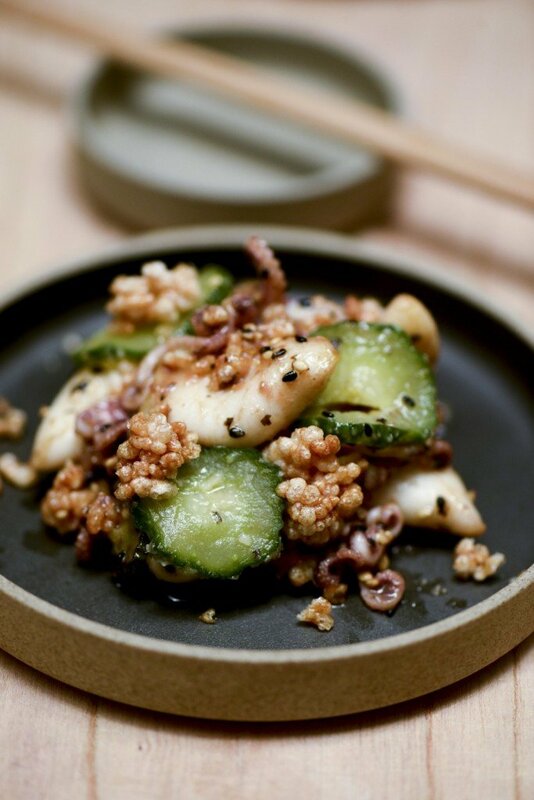 Baby squid, umeboshi, cucumber, crispy sushi rice. Kagoshima beef, maitake, egg yolk, crispy garlic. 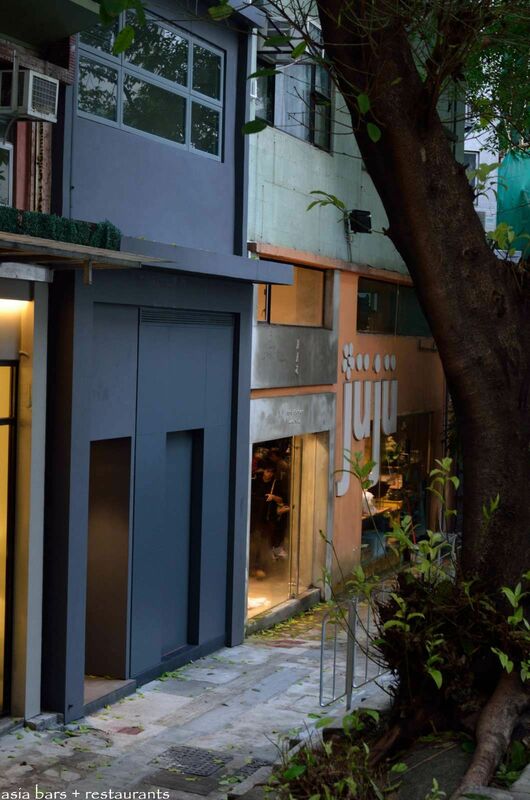 MTR: Sheung Wan station – Exit A1 – 10 minutes walk.